I’ve said it before and I’ll say it again. The best part of any party is the food! And our “We Love Walt Disney World” # DisneySide @ Home Celebration definitely didn’t disappoint. 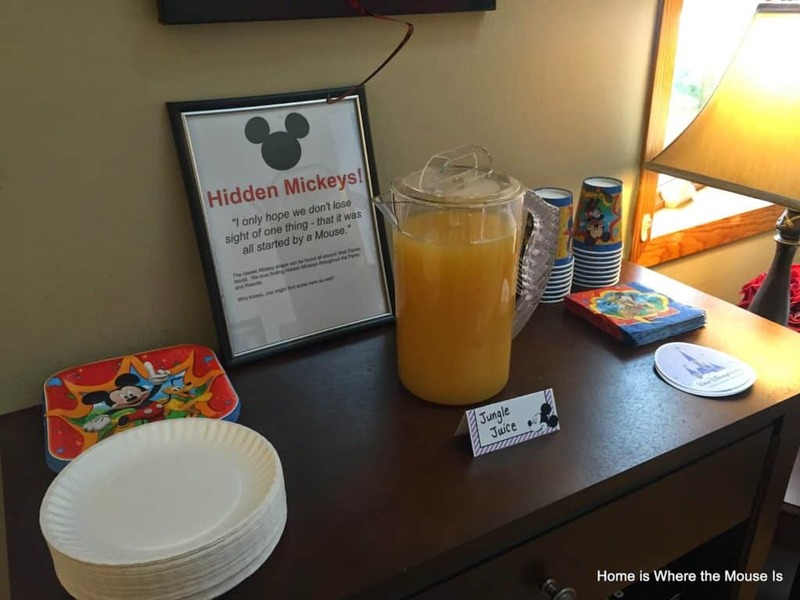 We wanted to make sure our guest got a taste of what Walt Disney World has to offer. 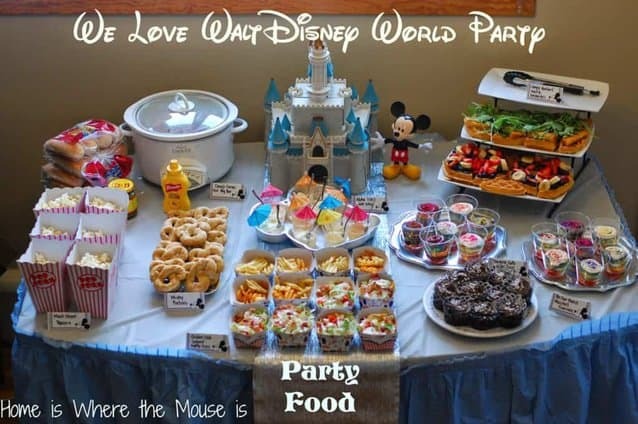 Our Disney snack food display included a wide variety of family and crowd favorites. James’ favorite quick service restaurant in the Magic Kingdom is Casey’s Corner. For our party we set up a hot dog bar. 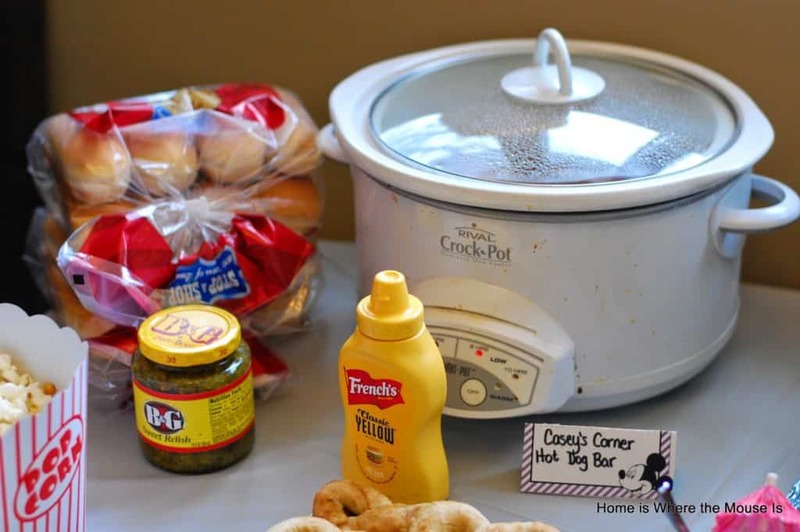 The hot dogs were kept warm in the crock pot. Guests could top their dogs with the toppings of their choosing. One of my favorite things to eat in the Magic Kingdom is a big bucket of popcorn. I love getting some, usually in a souvenir bucket right before the Main Street Electrical Parade. 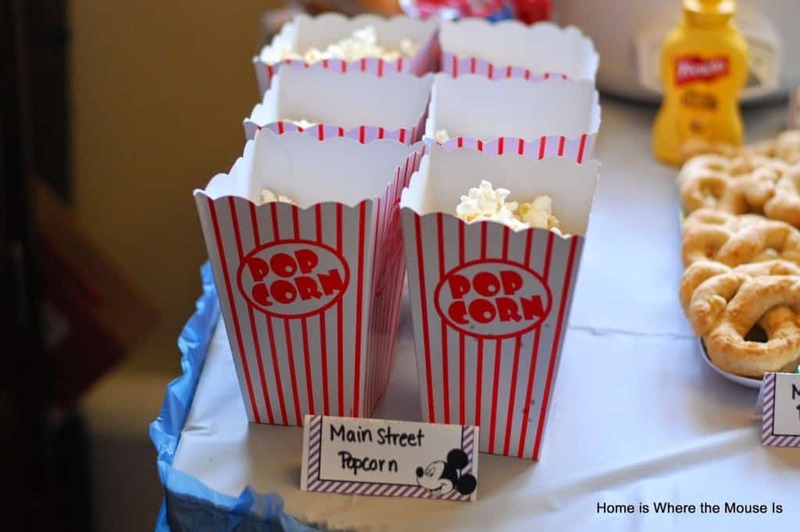 While it wasn’t Main Street popcorn, kids sure did devour this kind served in cute popcorn containers. 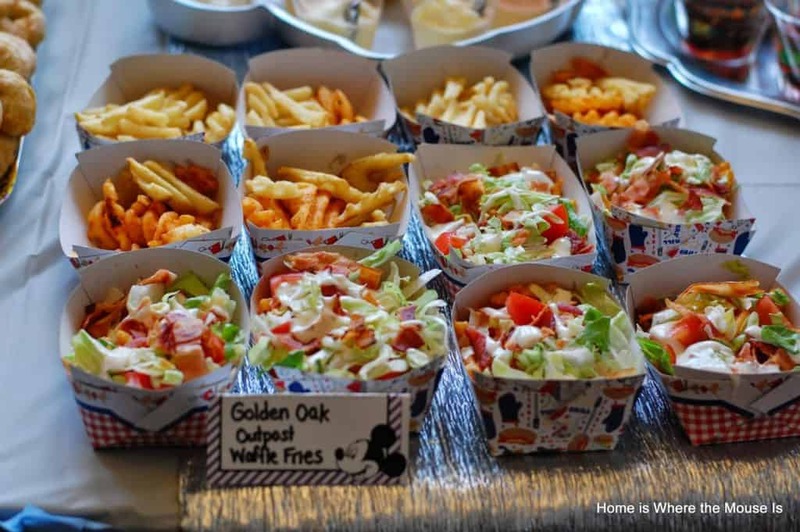 Golden Oak Outpost gourmet waffle fries are our new favorite go to snacks. I compare them to french fry nachos. We wanted to give our guests a taste of this new phenomenon. I made the BLT ranch flavor. I topped baked waffle fries with tomatoes, shredded lettuce, crisp bacon and a drizzle of ranch dressing. 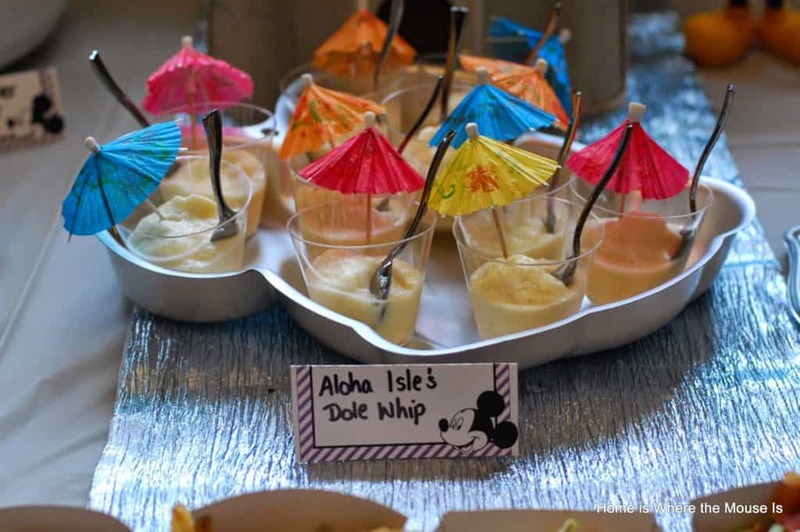 A classic favorite Magic Kingdom snack is the Dole Whip. I seriously didn’t think I’d be able to recreate these at home, but it was surprisingly easy. I followed the recipe for The Perfect Homemade Dole Whip and they came out great! 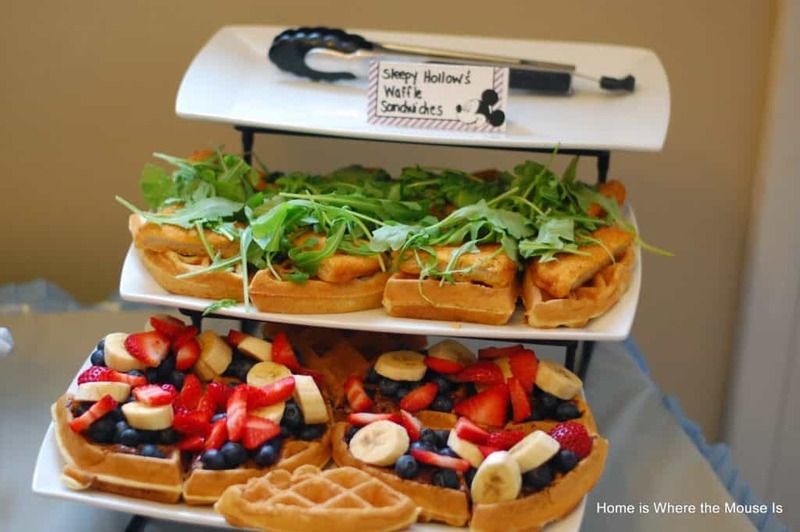 Sleep Hollow waffle sandwiches are more like a meal than a snack. For our party I made them snack sized. We served both a sweet and savory kind. The sweet was the Nutella with berries and bananas flavor while the savory was chicken with arugula. 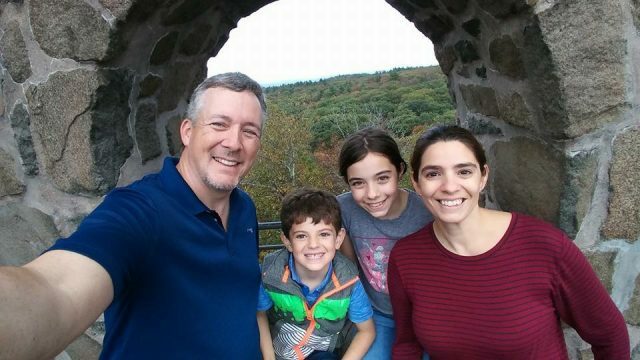 Try the grey stuff, it’s delicious! And it’s even better on top of a cupcake. My favorite cupcake in all of Walt Disney World is the Master’s Cupcake from Be Our Guest. I just had to make them for our party. I whipped up a batch of the grey stuff then piped in onto a rich chocolate cupcake. I then topped them with edible pearls. We also served another cupcake, this time in a cup! 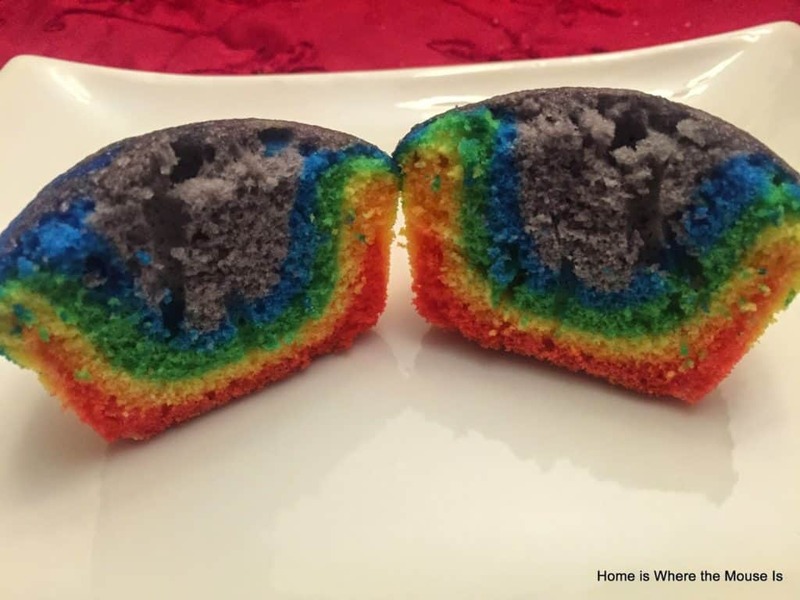 Using the Duff Goldman Tie Dye cake mix, I made a gourmet cake cup inspired by Cheshire Cafe in the Magic Kingdom AND the Tie Dye cheesecake from Pop Century. First I baked off a batch of cupcakes. I made them extra large. Once cool, I cut them into three. I layered the cupcake slices with cream cheese frosting. 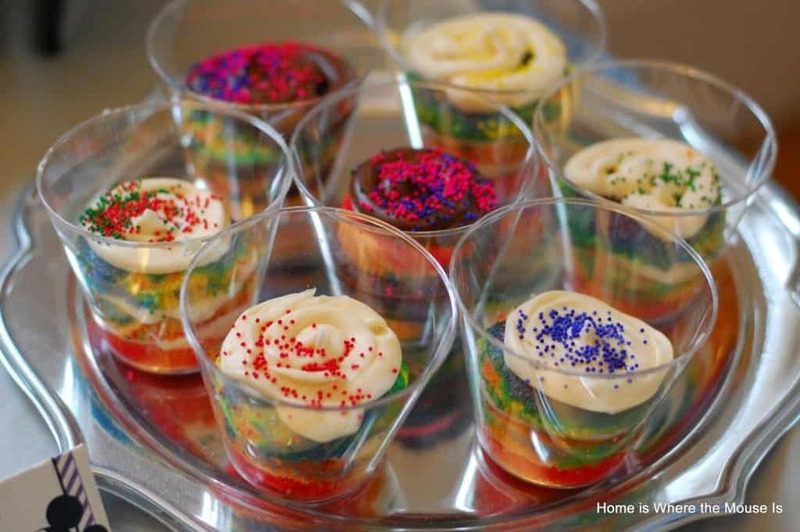 Each cup was topped with colorful sprinkles. 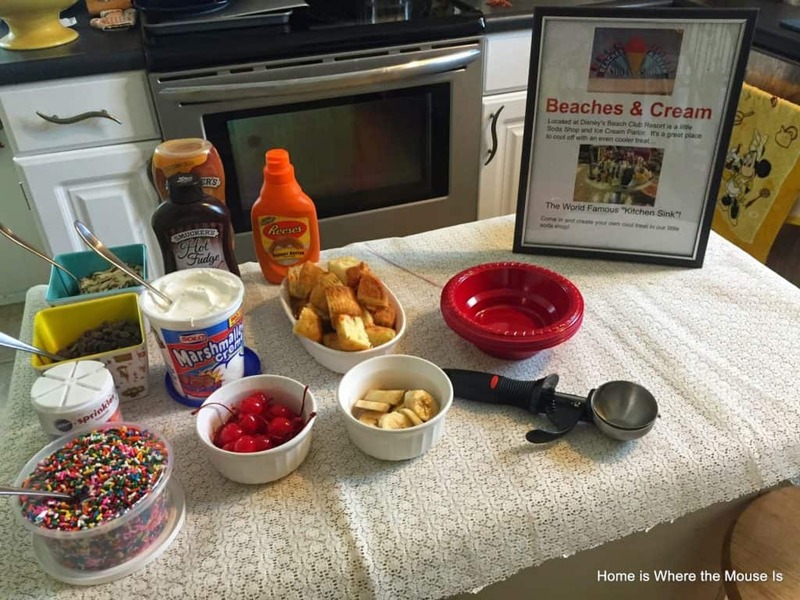 In our kitchen, we set up a mini Beaches and Cream Soda Shoppe. We assembled as many toppings as we could so our guests could recreate their own versions of a Kitchen Sink. To wash it all down, we made a batch of Jungle Juice or POG Juice, depending on where you dine. Passion Fruit, Orange and Guava juices combine to make this crowd pleasing favorite. I made 3 batches and they all went! 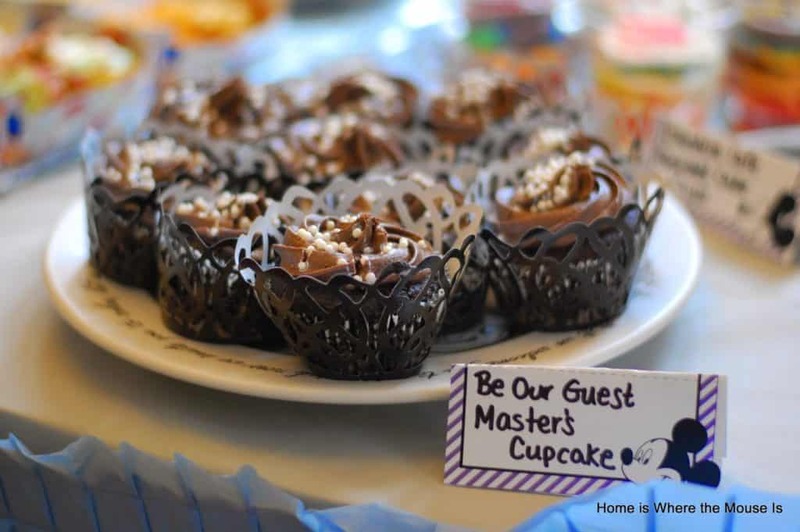 You can find all the recipes and inspiration for this and other #DisneySide @ Home Celebration parties on our Pinterest board. Follow Adventures in Familyhood’s board #DisneySide @Home Celebration Party Board on Pinterest. If you were at our party, which treats would you have liked to try? You can make the grey stuff?! Oh yes and it's really easy too! 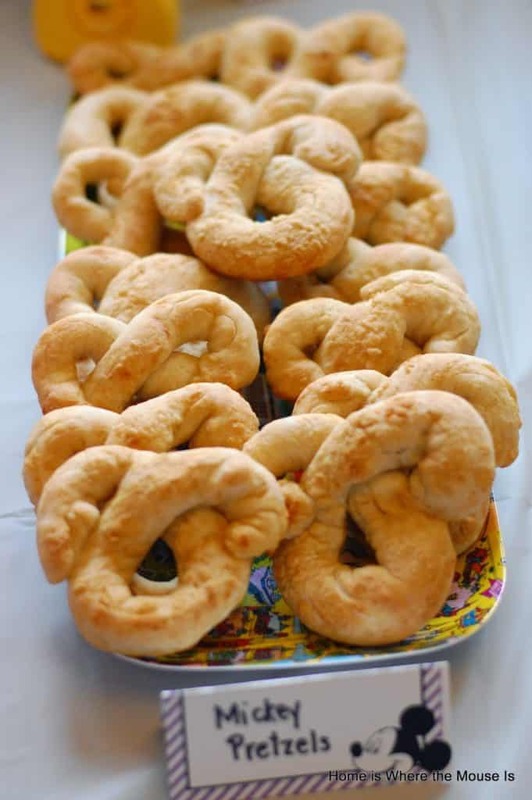 The recipe I used is on our #DisneySide Pinterest board.